Our loop style bike racks provide ample bicycle parking while taking up little space, perfect for entryways at malls, universities, and state parks. Also known as "Wave" or U" style, these bike racks are made available with in-ground of surface mounting options. We offer loop bike racks with both powder coated and galvanized steel finishes that are sure to perform for years without the worries of rust or corrosion. Choose from up to 10 unique custom colors to complement your venue's surroundings. Contact our expert staff for discounts on quantity orders or your own personalized quote. 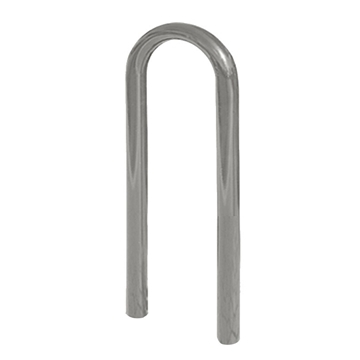 Loop Style Bike Racks are our most common bike racks. We offer the best selection of loop style bike racks all in galvanized steel that can be found in schools, public parks, and libraries. We offer trash receptacles, picnic tables, and everything else that you need to complete your project at the best prices only from Picnic Furniture. Loop or wave style bike racks are the most popular bike rack design on the market. Its simple anti-theft design allows for the most bikes to be parked while using up minimal outdoor space. We offer bike racks with a standard galvanized finish, or a wide variety of powder coated color options such as white, yellow, red, burgundy, forest green, royal blue, and black. These bike racks are sure to last for decades in any commercial setting with no maintenance required.